A franchise owner of The Little Gym once asked, "What could be better than improving the life of a child?" If you're thinking that you want to be your own boss, if you like making kids happy, and if you're looking for a rewarding experience, a Little Gym franchise might be right for you. This can be an amazing opportunity if you love working with children. The first Little Gym location was opened in 1976 by Robin Wes, who had degrees in psychology and physical education, and motor development. In the beginning, his The Little Gym concept was all about phys ed, but the franchise has expanded over the years to include intellectual and social development skills as well. 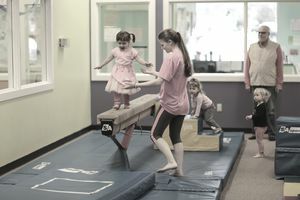 The company has been franchising since 1992, a motor skill development center providing non-competitive developmental gymnastics and sports skills classes for kids ages four months to 12 years. The Little Gym curriculum has been designed to help children build motor skills while still having fun. Each location covers approximately 4,000 square feet. The Little Gyms are usually located in strip malls or business parks. Not everyone qualifies to open a The Little Gym franchise. The company seems to be very selective about who is eligible and is not. You'll be asked to fill out a questionnaire when you request information about opening a franchise. Someone will review it and after several conversations with company personnel, they'll decide if you have the potential to be a successful franchisee. If so, you'll be invited to the corporate headquarters in Scottsdale, Arizona where you'll meet with senior management. This is a test, too—they'll make the ultimate determination as to whether you're qualified to become a franchisee. You'll receive the Uniform Franchise Offering Circular to review if you've met all the qualifications. As of 2017, a candidate must have a somewhat significant net worth—assets minus liabilities—of $150,000 to $200,000. You must have $75,000 to $100,000 in liquid assets in order to be considered—cash or assets that can be quickly and easily converted to cash. Expect that your initial investment will run anywhere from $152,700 to $377,000. This includes an initial franchise fee of $24,750 to $49,500. U.S. veterans receive a 50 percent discount. The Little Gym says it maintains relationships with third-party lenders willing to help out with financing. Ongoing fees include an 8 percent royalty fee and a 1 percent ad royalty fee. The Little Gym estimates that you'll need from five to seven employees for operation. There's an 8-day training period that takes place at the company's corporate headquarters located at 7500 N. Dobson Road, #220, in Scottsdale. Ruk Adams is CEO. Many former teachers, attorneys, and even doctors have opened their own The Little Gym franchises. These former professionals now have the wonderful opportunity to work with children and make a difference in their lives. If you qualify to open a The Little Gym franchise, it seems like an excellent financial opportunity as well as a very rewarding experience.